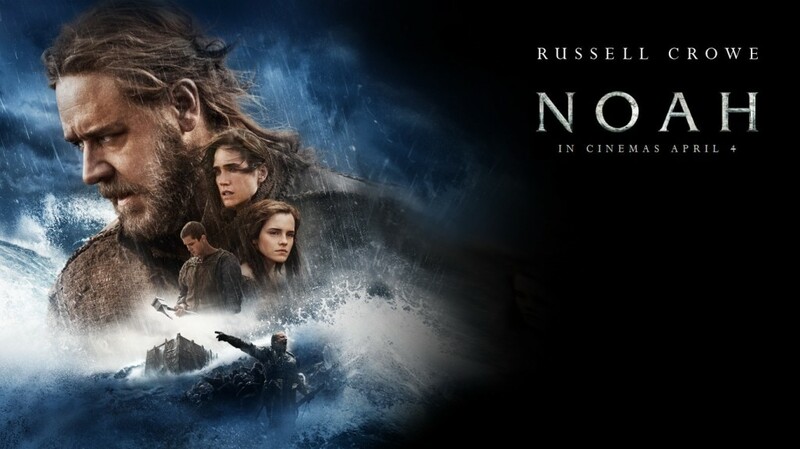 We end the first Apocalypse Week with Darren Aronofsky’s “Noah.” This was a film I’ve been curious about for sometime since Aronofsky is one of my favorite directors and it really does have an all star cast, and the subject matter is interesting. I’ve always been interested in mythology, whether it’s Christian, Jewish, Muslim, Greek, Norse, Egyptian or other…there are so many rich stories that have conflict and premises that are left pretty open ended giving a lot of creative leeway, assuming the director has vision. Aronofsky clearly did for this film. The story is that after Abel was killed by Cain, Cain’s descendants spread throughout the world and over industrialized it the point of making it a wasteland while hunting down the descendants of Seth who saw it as their duty to protect the world. The story begins with Noah and his father Methuselah doing the ritual of Seth for caring for the Earth. They are than attacked by a tribe of Cain who attack Methuselah. Noah believes him dead and we flash forward. We than see Noah dealing with visions from “God” of the Earth being destroyed which sets the story in motion as Tubal-cain and his men attempt to take the arc and Noah’s wife Naameh and family try to save more of the line of Cain and humanity as Noah resists at every turn. From here the story unfolds. The Pros: The Cinematography – The cinematography is fantastic, but I wouldn’t expect any less of Darren Aronofsky. Some of the moments that stand out though is when Noah tells the creation story and it shows us the creation of the universe and the evolution of life on the planet. The other scene is when the flood occurs and the descendants of Cain are destroyed as they fight the Watchers (fallen Angels defending Noah and his family). The Music – Clint Mansell is one of my favorite composers and he does a great job creating tension in this film. We see this especially when Noah believes it is his duty to keep man from spreading so when Ila is pregnant he plans on killing her children if they are girls. The music has it set so that the ship feels claustrophobic and being trapped with a mad man (Noah). It is brilliantly done. The Writing – The screenplay is top notch, Aronofsky and Handel did a great job. Every characters’ lines feels real and it does mostly showing rather than telling. Especially as Noah is facing the consequences of what he has done. We are presented with dilemmas. The Canaanites who are men are bad people trying to enslave and kill Noah and his family…but the women and children are innocent…and Noah does nothing to save them. His wife and Ham call him on this, but he ignores it, blinded by his religious devotion to a being who doesn’t speak clearly and maybe is all in his head. It is really awesome. The Watchers – Giant Rock beings that were once angels who came to fight for humanity. These guys are cool. They start out resistant to Noah and his clan because of how Cain’s line turned on them but in the end fight for Noah as they are rewarded with being returned to Paradise and Noah and his family treat them kindness. They have great designs and good voice acting. The Line of Seth – They are vegetarians and planters. Tenders of the garden of the world. Kind and only willing to fight as a last restort seems to the theme. They are survivors, but mostly because they know when to run. The Line of Cain – These are the warriors. Anything weak is prey and the story is empire. In extreme cases they are cannibals because they’ve killed off most of the animals and hunted them to extinction. They are the apocalyptic survivors in the apocalyptic world they created. The Characters – The characters in this film are really solid. No one is really wasted except for Noah’s son Shem who is mostly a passive character and is only there to protect Ila. Methuselah – Anthony Hopkins is great as Methuselah. He is found to be alive after Noah receives some of the visions and gives Noah the magic seed that creates an oasis of life that Noah and the Watchers use to build the arc. He doesn’t go with them and dies in the flood after a moment of bliss when he finds a berry. Why he decides not to go is unknown. He seems to be there as a guide and a counter to Noah as he gives Ila the ability to have children when she was barren before. Naameh – Jennifer Connelly supports Noah but always reminds him of life, which he mostly ignores if it isn’t animal and plant life. She sees the bigger picture and fights him when he plans to kill Ila’s twin girls. You can see how powerless she feels given that she’s expected and told to follow Noah, when Noah, especially when they are on the arc and before hand in how he saves no one else and has gone insane. You can see the trials she faces dealing with that. She is the one truly good person in the film. Tubal-cain – Played by Ray Winstone, he is the primary antagonist outside of Noah. He is a king and believes that humans were made in God’s image in order to dominate rather than to care and create. He is the one who tries corrupting Ham and almost succeeds as he taps into Ham’s anger at his possible partner being left behind by Noah in Tubal-cain’s attack. He fights to the end and is a crafty and interesting foe. He is survival of the species in the most extreme sense, though his inability to see how in ancestors had destroyed all life is sadly missed. I wish that had been brought up in the many talks he had with characters. Ham – Played by Logan Lerman, he is the character walking the line between the way of Cain and the way of Seth. In the end when they find land he chooses to go his own way. He wants to learn how to care, since all his actions are tied to his own wants and desires. He does this really well too and you can see why he hates Noah for a lot of the film. Ila – Emma Watson is the most successful of the “Harry Potter” cast post “Harry Potter” and rightfully so. She is damn talented. We see that hear too where she was a survivor of an attack on the mine where her family was raising her and Noah and his wife take her in. She is barren and it implied she was cut as a child. Because of this she has a lot of fear connecting but is able to heal from literally and figuratively after speaking with Methuselah. She is a great character and defends her children to the end. It is her showing them their innocence that staves Noah’s hand. Noah – Is he mad? This is the big question throughout the film. So much of the film you are left wondering if it is all just in Noah’s head as he thinks God wants to annihilate man completely given the near extinction of all life by many of Cain’s line. You can see where he is coming from too as miracles do happen throughout the film. The big issue is when the daughters are born and he has to break away from what he believes God’s message is. He believed God wanted them to restore the Garden, so after they help the animals all survive…they would die out. What he misses in his nihilism is that humans are part of the world too and it is only after accepts that that we see him deal with the guilt of letting the innocent Canaanites die and the fact that he nearly killed his grandchildren and planned on doing so for quite a while once he knew they would be born, and if they would be girls. Russell Crowe does this really really well. He is good at playing complex mad characters, which Noah is. We see him wrestle with his decisions and face the reality of his character relationships. He eventually becomes a drunk when they reach land once more but is brought out of it when he is reminded once more of life carrying on…showing that he has changed from the man he once was. The Message – The message is dilemmas. Is humanity redeemable? What makes a civilization worth saving or not saving? What does it mean to be human? What responsibilities do we we have as human beings? This film deals with all of this and lets us make our own decision. Noah is not a good person, but he is a human being. It is through his eyes that we are shown the question and can judge Noah for the decisions he makes. This is powerful and makes the film truly a masterpiece. I’m glad this is how Apocalypse Week ends. This is one of the greatest films I’ve watched, though I can see why so many were torn about it. The thing to remember is to take it on it’s own merits. Like all films it is a story and a good story at that. What message you choose to take from it is up to you as Daronofsky leaves it pretty open ended. He leaves the hope for us with Seth’s line surviving after the flood, but doesn’t say that the flood was Just. That is up to the viewer. The actors and actresses, cinematography, music and writing are phenomenal and I highly recommend to anyone looking for a great film based off fantasy and mythology that lets you find the meaning in it. Final score is 10 / 10. Shem isn’t a great character, but he isn’t bad. None of the minor characters who don’t get exploration hurt the film in anyway.